Thirsty Pilgrim: Malting Pot, The Festival, and Wise Counsel. Many thanks to local agents Darin and Anne for snapping this shot of the new Malting Pot bottle shop on Saturday, its grand opening. Here is last week's post, in which we all learned about the shop together. The owner's name is Sam Sarmad, and he knows how to open in style: free beer on tap. And just look at those happy families, drinking Senne's Jambe de Bois and two from Binchoise, including the Belgoo Saisonneke. Now, let's stop and notice that last beer together: a new Wallonian saison at 4.4% alcohol by volume. Haven't tasted it yet, but it does speak my language. If you're keeping score, yes, Belgoo's Jo Van Aert is still brewing at Binchoise in Binche, home to that crazy carnival in Binche where the guys put on those creepy masks. A nice label too, which someone at ZBF was nice to snap here. That's a beer I'll be hunting this summer. Back to the shop. The prices are a bit higher than what one would pay from a drinks market like SBS or BVS, but that is to be expected from a bottle shop. We will see if the locals take to the idea. Certainly that is Sarmad's hope. "The purpose of the store is to offer Belgian and foreign craft beers not available in supermarkets and other shops in Brussels," Sarmad told me in an email. "Even though tourists are welcome, I wanted a beer shop for people living in Brussels and offer them an assortment of beers they don't know, while trying to keep affordable prices. 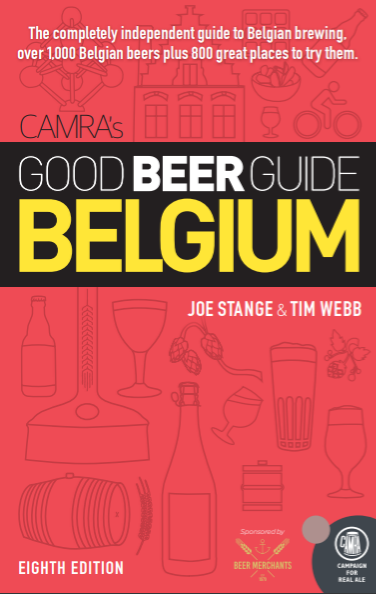 After the recent hoppy/IPA revolution in Belgium, I also wanted to offer to the 'beer geeks' some Belgian and foreign craft beers, very difficult to find in Brussels." 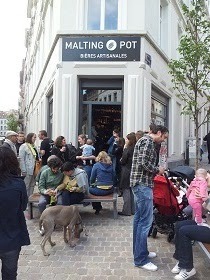 Incidentally, the Malting Pot will be closed from July 22 to August 6. Plan accordingly. Other news: Last week I updated an earlier post about The Festival, the one organized by the Shelton Brothers in Worcester, Massachusetts. In case you missed it: The ticket prices have dropped to $60 per session. A weekend pass for all three sessions is $160. It's not cheap but it's also not out of whack with a lot of U.S. beer festivals these days (a topic for another day, I think). And if you're into some of the world's most interesting beers and meeting the people who make them, then it will likely be worth every penny. If you are one of those folks getting irked by expensive craft beers and festivals in the States these days -- and who isn't? -- then I have some simple advice for you. Stop buying whales and instead subsist on that local pale ale you've always liked but always ignore. Save those duckets, buy a plane ticket, and go to where the beer is cheap. Make a trip your whale instead. I'm back in the US after 2 lovely years in Belgium and I find the tickets for US brew festivals prohibitively expensive (and that my taste palette is seriously Belgian, and that I've outgrown hops. OH noes!). Zythos and Alvinne and all those jetons seem to me the way to make a grown-up festival. Btw, thanks for blogging a good bit more in these past few months. It's nice to keep up there. I'm in a bit of culture shock with drinking, no bike riding, and in general good weather, but I still miss Belgium. A lot. Hi Neeli. Much could be written about the differences between Belgian and American beer festivals. Time to generalize: A Belgian one is a cheaper and more comfortable experience for the drinker, whereas an American one tends to have higher ticket prices and longer lines for smaller samples of beer. You and I have been spoiled. On the other hand, it's not apples to apples. An American fest tends to have many more drinkers per brewery or stand. We also have that repressed Puritan streak in our culture that can't resist a good piss-up, even if it has to come in 1-ounce servings. Most Belgian beer fests (but not all) have a higher percentage of hard-core swirling-and-sniffing enthusiasts versus people just looking for a party. But invite a bunch of friends to a beer fest in the States, and most of them will say yes. Because you have just invited them to a party. Ticket and token prices are tricky too. Belgian fests often ask too much of the brewers for too little in return (and as drinkers we benefit from that). At American fests this varies wildly, but I wonder if there has been a trend toward limiting attendance and raising ticket prices... a welcome one, I think. Waiting in long lines for small samples in crowded venues is no fun and a complete waste of time.